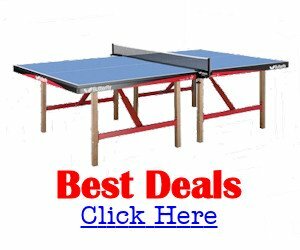 Do you know what table tennis room size dimensions you need to have? 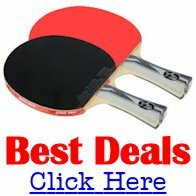 Compared to most other sports, the minimum size requirements for playing table tennis are relatively small. Therefore the game can be played almost anywhere. But just because you can play table tennis in small spaces, it doesn't mean that you should. 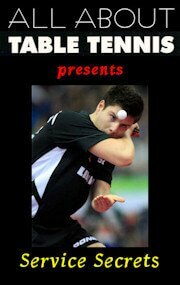 Ideally, table tennis should be played in a dedicated space with appropriate facilities permanently available. However, that's not always possible. 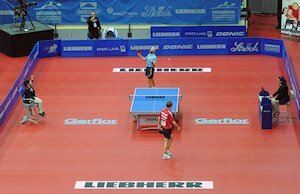 The main factor in determining what table tennis room size you'll need will be the standard / level of competition being played. So let's take a look at the various room sizes required for different standards / levels of table tennis competition. 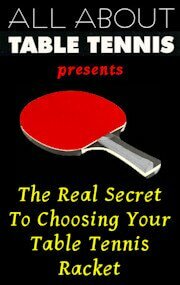 Of course, if you want to play table tennis at home you could use any space that will accommodate a table tennis table. 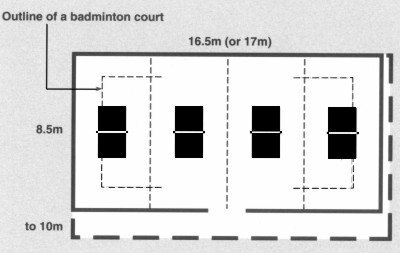 However, any area smaller than the recommended size of 8.5m x 4m (28 feet x 13 feet) will mean that you'll be restricted in either the type of strokes you can use and/or your style of play. But remember, the idea is to HAVE FUN, so if you've only got a restricted space available but you still want to play, just adapt your style. Uniform lighting over the whole of the playing area is essential. In my experience, lots of venues which are used for table tennis don't have any specialist lighting. Instead, they rely solely on general room lighting which is just not good enough. Consequently, many venues are too dark. The minimum ceiling height will therefore be determined by the lighting criteria, so the minimum ceiling height will be 3m (10 feet) above the floor. A good floor and/or floor covering is of paramount importance and, as your standard of play increases, it'll probably become your number one priority. Whatever type of flooring you have, the most important criteria is that it's non-slip, because players have to be able to move rapidly and re-position their feet without slipping. 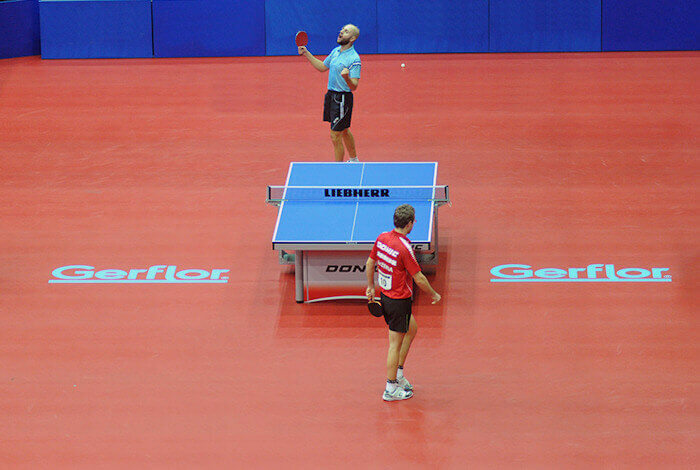 The floor must also be smooth and level and able to support the weight of the table tennis table and the players. Wooden semi-sprung floors provide the best surface whereas solid concrete and carpeted floors are totally unsuitable. The flooring must also provide a good contrast between the table top surface and the surrounding areas, both for the benefit of the players and the spectators, so it should be non-reflective. 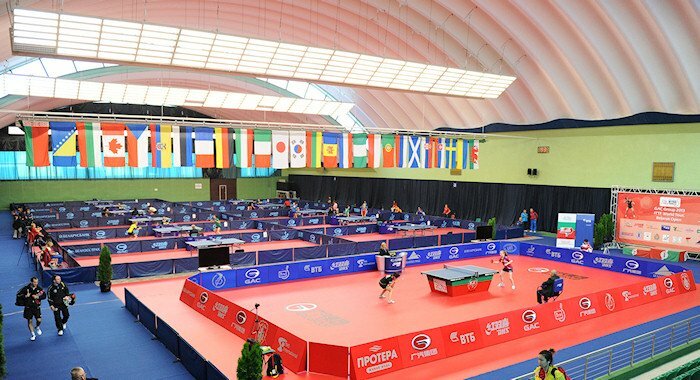 All the top international table tennis tournaments now use specialist sports flooring such as Taraflex® made by French company Gerflor. The reddish colour of this flooring, together with blue tables, provides a fantastic setting for table tennis. 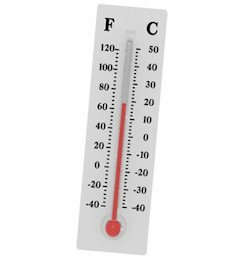 The ideal room temperature is 15-20○C with a relative humidity of 40-50%. It's also important that there's adequate ventilation because any condensation will make the floor slippery and will cause the ball to slide off your racket if you're using reverse rubber. If there are any air conditioning units, you'll also need to ensure that they don't cause any air currents which will deflect the flight of the ball. Spectators' comfort should also be considered, but obviously the playing conditions take priority. The colour of the walls is important because the players need a good contrast between the floor, table and wall colours. They should be non-reflective and painted with a dark colour up to a height of at least 2.5m (8 feet). Above 2.5m the walls should be painted a lighter colour so that you get maximum benefit from the lighting. Also, if there are any windows or other external light sources, they'll need to be covered up. 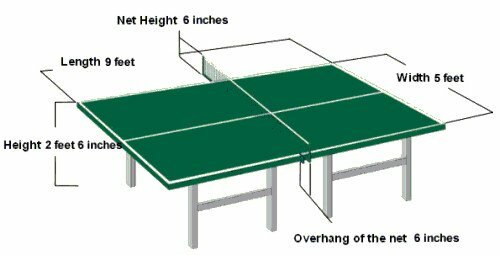 If you're using a table tennis room size that can accommodate multiple tables, they should be arranged side by side rather than long ways. Ideally, you should also have a gangway so that you can easily access each court without the need to disturb the other courts. For more information about different table layouts, see my article here. Barriers between your table tennis tables will be very useful to stop the ball from straying too far and minimise interruptions from other tables. However, these table tennis barriers must be collapsable rather than solid, so that they won't harm any player who runs into them. Ideally they should be about 1.5m (5 feet) long and 75cm (2 feet 6 inches) high and should completely enclose the playing area.